Deer Feeders are important to have when preparing for deer season. Start this deer season the right way with Platinum Deer Feeders! 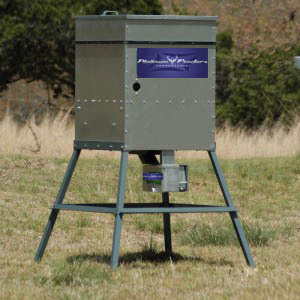 Platinum Feeders are dedicated to building premium feeders for all your hunting, pond management and livestock needs. All feeders are hand built in Ingram, Texas. Platinum Feeders brings you the most unsurpassed feeders on the market built with the finest available materials, top craftsmanship and unmatched designs. These feeders are built bigger, better and stronger than anyone else’s on the market we put a lifetime warranty behind everything we build. If you have any questions, please give us a call at 830-997-2256 and we can help you with all your feeder needs. This entry was posted on Tuesday, July 25th, 2017 at 2:52 pm	and is filed under News & Updates. You can follow any responses to this entry through the RSS 2.0 feed. Both comments and pings are currently closed.